The most commonly awakened school in modern Spellcraft, Evocation is a school that manipulates energy. Evokers become the mainstay of the citizen-soldiers, wielding spells of Fire, Earth, Water, and more exotic elements such as Lightning or Radiance. As Evokers mature, they become more specialised in a particular elemental affinity, taking up specialist equipment, attunement and contract Spirits. In the media and propaganda, the Evoker is the archetype Mage, the spell slinging, fireball blasting Sorcerer of yore, tapping into and drawing limitless power from the elemental planes. Abjurers weave spells that protect, block, dispel or banish. An Abjurer is a common but highly sought after profession. Abjuration made Shielding Stations possible. An Abjurer possesses the unique ability to utilise restoration spells such as De-Curse and the ability to dispense protective AOE combat buffs. Specialists in this field typically contract elementals of earth, ice, and water, all of which are relatively common. Conjuration is a school that materialises creatures or materials for the caster. A Conjurer becomes a one-man army after mastering higher tiers of Magic. Through Familiar rituals and or contracting Magical Creatures, Conjurers gain life-long companions that grow with the Mage in power. Due to this advantage, it is not uncommon for Summoners to become several magnitudes more powerful than Mages of equal tier. The disadvantage of Conjuration is the persistent mana drain caused by most of its sustained effect spells and crippling loss of combat potential to specialised Abjuration such as Banish. Certain Conjurers choose to focus on the summoning of items or beings. These valuable individuals are also responsible for the Teleportation Circles around the cities. Diviners reveal information. They are highly prized for their cognisant abilities in detection and foretelling. Many diviners go on to become telecommunication specialists, becoming key intelligence and strategist operatives who serve a multitude of critical roles. Other schools of Divination focuse on disaster deterrence, by reading the threads of time and fate. Despite their lack of offensive capabilities, it is said that the most influential Magi on the United Nations Council is the Oracle of the Acropolis. Though the Divination school has no preference for elemental afflictions, it is a school that synergises well with subsequent studies of other schools. Many Diviners go on to become Magus or Magister. The school of Enchantment remains the most difficult and expensive to train of all schools. Capable of imbuing items and buildings with protection, strengthening materials and extending persist phenomena - Enchanters are essential to humanity’s cities. The world's most successful manufactoriums and artisanal workshops are all operated by skilled Enchanters. Unlike regular Mages, many Enchanters seek to master additional schools such as Transmutation or Abjuration for the creation of magical items. A dangerous school within-a-school of Enchanters are those whose abilities allow them to control, manipulate, and glamour the minds of others. Mind Mages are closely watched by government forces, for the misuse of mind-altering effects on others could lead to life-imprisonment or banishment. Illusion is the magic of mirage, the altering of perceptions to create false visions. Many Illusionists go on to become involved in espionage if they choose the path of the militant. Many others, however, have elected media and entertainment, creating spectacles for adoring audiences, becoming superstars of immense prestige. Illusion spells which deal damage attack the mind directly, creating what is known as psychic feedback. Transmutation is an unusual school in that it changes the caster and the objects they touch, manipulating the properties in powerful ways. In the present world, Transmuters become builders, architects and creators, working hand-in-glove with Enchanters. In combat, some Transmuters choose to specialise in manipulating life itself, changing plants, creatures, and even themselves to become deadly and proficient in the art of war. It is said that Transmuters posses the most versatile school of all and enjoy the most lauded status after that of Evokers. An overall well-rounded School of Magic. The Clerical School of Healing Magic has always existed in human history in one form or another. Some say that this was the original 'School' of magic. In Modern Spellcraft, Clerical magic exists between Conjuration and Evocation, and is considered a 'hybrid school of magic'. Exclusively, Biomancy requires Mages attuned to the Positive Energy Plane. The combination of Healing Magic and Positive Energy often shrouds the Biomancer with a 'halo' of sorts. The dreaded School of Necromancy was banned after WWI following the Geneva Convention. Currently, the school is studied only by Sects authorised by the U.N, arguing that the study of souls and the afterlife is inseparably connected to matters of faith, culture and religion. For many scholars, the irony of the matter is that Necromancy is most likely the most ancient school of magic in the world; dating back to the Egyptian Pharaohs, in an age when man first uncovered magic. As such, it is more accurate to say that the summoning, raising, and animation of the dead is strictly forbidden, as much of the old world had turned into ash and cinder following The Great War with the Undead. Post Note: Other schools of magic likely exist but lie beyond the reach of the ordinary Mage. These include Faith Magic, ancestral worship, old world shamanism, naturalism, animalism, and so forth. By the same measure, rumours of humans learning the magic of monsters, magical beings, and demi-humanoids, or Demi-humans learning Human Spellcraft abound. The Primary Elements of the Material Plane are what Astrologists propose our world is made from. It is the very stuff of existence itself, existing in perfect harmony. It is suggested that when a Mage is attuned to a certain element, it is because that an excessive element is present within their body. Though exceedingly rare, there exist individuals who are born capable of tapping into all four Prime Elements, becoming mages capable of manipulating 'wood' and other natural phenomena, hypothesised by Eastern Spellcraft as an individual element. The Positive Plane - The Plane of Positive Energy is a place of pure life-force, it is where the healers draw their power to heal and mend one's broken bones. The Undead are fearful of this energy, and the unwary caster should be as well. Too much positive power without the ability to channel it may lead to strange mutations and cancerous tumours. Negative Energy - Where Positive is life, Negative is death. The Undead are tethered to this plane, drawing their undead lifeforce from this domain. When 'living' creatures utilise Negative Energy, they suffer Negative Drain, rapidly diminishing vitality. In the old days, the Mage world saw the Negative Energy as just another source of power. After WWI, Necromancy became highly controversial, gaining a dangerous reputation as a forbidden craft. Earth - Earth is one of the most useful and common elements awakening in Human Mages, it is the element responsible for most of our industry, mining for Mana Crystals, building our cities, and so on. It is said that one-fifth of Mages awaken as Earthen Mages. Air - The Elemental Plane of Air, as the name suggests, a place of gases and open space, frequently filled with thunderstorms, blizzards, microbursts, tornadoes and all manners of interesting weather phenomenona. Of the four common Elemental Affinities, Air is the rarest. Fire - Fire is another common element Mages manifest. Ancient legend has it that Fire was stolen from the Gods themselves. With Fire, man has created many useful tools and beaten back tides of monstrous creatures. Fire is another common element for Mages to possess and the mainstay of Combat Evokers, Transmuters and Conjurers. Water - Assumed to be a near-infinite volume of water, this Elemental Plane is pivotal to the survival of modern magical cities. The Plane provides Human cities with its supply of fresh water. Likewise, human cities pump its waste-water back into the Elemental Plane. 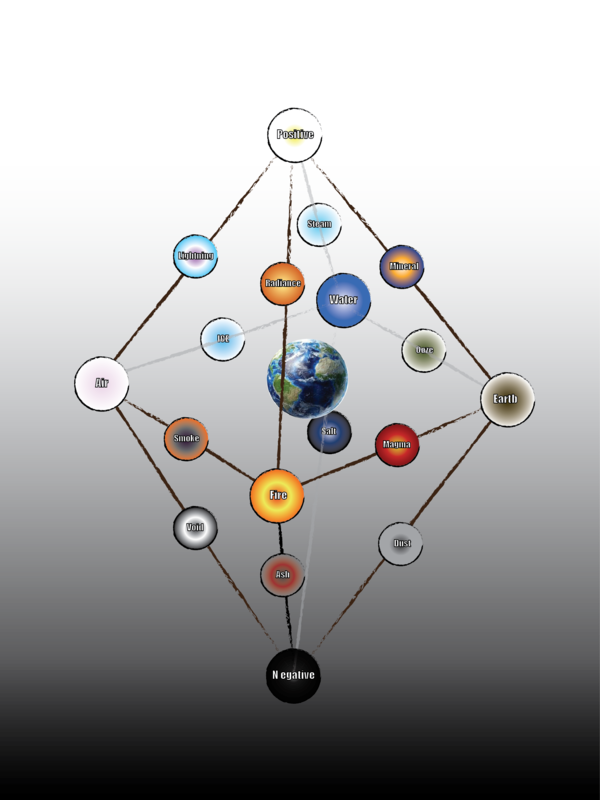 It is theorised that the Oceans are directedly connected to this Elemental Plane. Water Affinity is exceptionally common among coastal communities. Ice - Ice is the most common Para-Element to awaken in Mages. It is a supremely useful element that creates drops in temperature - being a combination of Air and Water. The Plane of Ice is said to be a tumbling expanse of frigidity with islands of glacial ice. Ice provides good defence and offence capabilities, as well as chill and slow effects against water-based enemies. Ooze - Ooze is a stranger element, scarce and virtually non-existent outside of isolated magical bloodlines. Ooze Mages are specialists, pending on their school, with spells that focus on entrapment, debilitation, poison, and other strange and mysterious effects. A speciality of the Ooze Conjurer is the ability to summon creatures that exist within that elemental plane - Oozes. It is theorised that some oozes are virtually indestructible except by other Specialist Mages. Ooze is the combination of Water and Earth. Mud is a derivative of Ooze, though far closer to the Elemental Plane of Water than true Ooze Mages. Magma - The Magma Mage is unique indeed; a rare combination of Fire and Earth. These Mages are typically found where there are volcanic islands or fjords. Their power combines the physical prowess of the Earth Mage, with the damage potential of the Fire Mage. Smoke - Smoke is the marriage of Air and Fire. Smoke is an element that is said to only exist in legend. Very little is known about Smoke Mages or the Para-Elemental Plane of Smoke. Mineral - Mineral Mages take their capabilities in the form of specialised mineral or metal to which the caster is attuned. As such, the Element creates distinct abilities that differ from Mage to Mage. A Mage capable of summoning volcanic stones, for instance, would generate obsidian shards which are brittle and fragile but possess dangerous offensive capabilities. Jedite Mages create powerful super-dense defensive layers. There are rumours that King Midas was a Gold Mage. Lightning - Existing between the Air and Positive Elemental planes, Lighting is the most penetrative of all elements due to its electrical nature. Lightning causes stun and paralysis, in addition to manifesting instantly and delivering payloads in a fraction of a second. Lightning Mages are preferably Evokers, Conjurers or Transmuters. The Quasi-Elemental Plane of Lightning is said to be a place of plasma, ozone and endless thunder. Steam - Where the Positive and Water Elemental Planes meet, one gets Steam. Steam is a rarely seen element. Only a handful of Mages are on record as having tapped into a Goldilocks' zone where two Elements meet in harmony. There is little known about the Plane and its Elementalists. Radiance - Radiance is formed from Fire and Positive energy. Often mistaken as the power of Light. In theory, it should be useless, too scattered to be used offensively - too dispersed to be used defensively. It takes a special Mage, therefore, to change something so immaterial into a powerful projection of destruction. At a certain intensity, Radiance is capable of melting through solid steel, boiling blood, searing flesh, and severing matter. Not much is known about the Elemental Plane of Radiance. Ash - A derivative of Negative-Fire that manifests corrosive ash and black flames. The most destructive element in the array of Elemental Planes. Ash Mages rarely live long as the Element eats away at their minds. It is said that Ash Mages exist as tortured existences whose ruinous powers rack their bodies with unbelievable pain. If one is Negative Drained by an Ash Mage, one loses one's seven emotions and six desires. Dust - Dust is the most stable of the Negative Quasi-elements, next to Salt. It doesn't have any offensive capabilities of its own but enjoys the same corrosive ability drain as Ash. The most annoying part of fighting a Dust Mage is their ability to deaden all elemental damage. Due to its abrogating nature, Dust consumes Fire, Water, Air, Lightning, even Ash. It is said to be the most stalwart Abjuration Affinity next to Mineral. Salt - Salt is a stable Negative Quasi-element, with the additional ability to form into a range of crystalline shapes. It's capable of dealing extreme damage to Slimes and Oozes, as well as an assortment of creatures composed mostly of water - including Humans. The desiccation caused by the Salt Mage draws out elemental water from the bodies of their enemies. Elemental Salt is different from mortal salt, found in oceans and sometimes in rocks; it is formed where Negative Energy and Water meet. Salt is the least destructive of Negative Quasi-elements. Void - As the name suggests, the Elemental Plane of Void is a place of vast, perpetual darkness, where strange, forgotten things lurk in a vacuum darker than black, always hungering. It is a Plane consisting of the very idea of nothingness, a place where forgotten things end up. When manifested in the Material Plane, Void consumes matter, then disappears. Like Steam and Smoke Mages, very little is known about Void Mages. Arguably, the most famous Void Mage in Modern History is Elizabeth Sobel. Astral Body - The cognitively generated projection of one's connection to the Multiverse, visualised via indoctrinated Spellcraft. Typically manifests as a humanoid silhouette with abstract details pertaining to the user's Sigils and Elemental Affinity. Elements are perceived to be within the astrophysical body, while Sigils manifest Externally. Only Mages possess Astral Bodies. Physical Body - No matter how powerful a Mage may be, they are still biological creatures that need to eat, crap and sleep, subject to Eros and Thanatos, life and death. The Physicality of a Mage tends to reflect the degree of their Elemental affinity. Most infamously, Earthen Mages have rock-hard physiques, Air Mage are frail and flighty, while Lightning Mages have quickened metabolisms. Anima (Animus) - Drawn from the theory of the Meister Sigmund Jung, the psyche, the Anima (male psyche & common vernacular) and Animus (female psyche) inference a being's subconscious self-awareness. Only sapient creatures are classified as capable of possessing Anima and Animus. Mana - The Gurus of Hinduism refer to this as spiritual energy or Prana. Chinese Doshi denotes this spiritual energy as Qi. Early Western Theology referred to this energy as Faith or Zeal. Modern Spellcraft unified the term as Mana, a generic word for mystical 'energies' of any kind. The Astral Body produces mana as it interacts with Glyphs and Gates, channelling mana into conduits of the physical body. Mana Pool - The maximum amount of mana which a Mage can produce. When the Astral Body is no longer capable of producing mana, this is referred to as OOM, or Out of Mana. VMI - Volumetric Mana Index - is the official nomenclature for measuring a Mage's mana pool. Mana Channel - Often confused with the concept of a Mana Conduit. A Mana channel refers to metaphysical pathways by which Mana produced by the Astral Body enters the Mage's physical body. A Mage's Mana Channels can never be damaged without injury to their Astral body. Gate and Conduit - A Gate refers to nomenclature describing the effect of non-elementally attuned mana becoming suffused with the Mage's Element. This 'elementally-attuned' mana then feeds back into the physical body. The pathways through the Mage's physical body are referred to as Mana Conduits. Damage to the physical body damages one's Mana Conduits. Essence - A metaphysical form of energy derived from a being's existence. Referred to commonly as one's 'Soul' or "Spirit" in ancient Spellcraft, contemporary Spellcraft sees Essence as a hitherto little-known form of energy, separate from mana. Creatures possessing great magical power and ego possess higher degrees of Essence. Likewise, sapient beings typically possess greater essence than their non-sapient peers of the same subtype. NoMs, in general, possess little Essence. Human and Demi-human Mages possess immense Essence, a fact profoundly valuable to the study of Necromancy. Theoretical Spellcraft propose that Essence is tied to a Mage's ability to access particular Schools of Magic. School of Magic (Imperial Metric Schools) - Since unifying the study of Magic under the IMPERIAL METRIC system during the Spellcraft Revolution at the turn of the 20th century, 7 Schools of Magic exist: Evocation, Transmutation, Conjuration, Abjuration, Divination, Enchantment and Illusion. Hybrid School of Magic - Rarely, some Mages awaken with Magic in between the Sanctioned Schools of Magic, belonging to no School. Of these types of Magic, Biomancy: the manipulation of Postive Energy and Necromancy: the manipulation of Negative Energy, reign supreme. Awakening - The term is loosely used to describe an Acolyte coming to terms with their first School of Magic and their Affinity for an Element. In Frontier cities, NoM Civilians are filtered, with potential Mages tested for aptitude. In tier 1 cities, Mages naturally grow into their powers, training from an early age. A 'Stimuli Crystal' may be used to induce an Awakening, circulating mana into the recipient as to 'jolt' their Astral Bodies into existence. Spellcraft - The study of Magic. The Imperial Metric System (IMS) splits spells into 9 Tiers. Advanced Spellcraft Theorems - Spells whose theory and manifestation fall outside of existing methodology. Most universities study Advanced Spellcraft to push past the current boundaries of human knowledge of Magic. Those who contribute significantly to this study are awarded the title of Meister. Sanctioned and Unsanctioned Magic - Sanctioned Magic may be purchased by Tower Mages with LDMs, HDMs, and CCs. Unsanctioned Magic may only be acquired through petition. If a Mage is found practising unlicenced Unsanctioned Magic, they are subject to severe punishments and even disbarment. Sigil - A spiritual manifestation of one's affinity for particular forms of Magic, tied to the generation of one's Astral Body during Awakening. Each school of Magic possesses a unique Sigil under the IMS visualisation doctrine. Glyph - Sigils exist only in one's mind. When Mages wish to manifest the concept of Sigils externally, they turn to Glyphs. Glyphs vary but may be thought of as symbols of power capable of channelling Magical energy as though a man-made conduit existing outside the Mage's body. Magic Items and Enchantments such as Wards rely exclusively on complex Glyphs and Mandalas. Mandala - Taken from Tibetian Mysticism, Mandala refers to large-scale, complex Glyph arrays used to support complex Spellcraft manifestations. Spell - A series of Incantations both somatic and verbal which triggers magical phenomena when exercised with mana from a Mage's Astral Body. Rite - A spell requiring time, preparation, and setup, typically includes meditation, ritual and complex external components. Rites include city-wide Strategic-Class Spells. Incantation - Invocations with somatic and verbal components. These are mnemonics which manifest Magic through Sigils. The higher the 'tier' of magic, the more complex and convoluted the number of Major and Minor Incantations. Senior and experienced Mages may specialise in particular spells so that they become 'silent'. Shield (Mage) - Shield refers to the mental ability for Mages to form a barrier of mana around their physical bodies. Even without training, a Mage is capable of manifesting a membrane of mana, projected just outside of their physical body, which displaces hostile mana and foreign objects. Abjuration specialises in forming persistent Shields and Shields that can manifest on Mages OTHER than the caster. Acolyte - Neophytes and Acolytes are the colloquial names for beginner Mages. The moniker of Mage or Senior Mage is given to those with mastery over at least one school of magic, meaning access to spells over tier 4. Magus - A Magus is an arcanist who has gained multiple Schools of Magic through talent or laborious study. To be called a Magus in public, the Mage must undergo examination within a Tower. Magister - Likewise, a Magister is a peer-reviewed, publically sanctioned Magic Caster. Unlike the moniker of Magus, Magister is a title that comes with the weight of public service and responsibility of upholding the Tower's interest. Meister - A Meister is a Magister, but not all Magister can become a Meister. A Meister is a Mage who has contributed significant advancement to Spellcraft, and whose work benefits all of Mankind. Claude Van Saint, the famous healer who pioneered modern magical medicine, is a Meister. Philo R. Farnsworth, the man responsible for proving that Illusions may exist as a form of media stored in Capture Crystals, is a Meister. As powerful as famous individuals like Henry Kilroy has been, his preference for keeping his studies wrapt and secret excludes him from the title of Meister. Magi - A Mage whose power and command over Spellcraft exceed Sanctioned limits, going beyond the 9 Tiers. A Magi rarely concerns themselves with worldly affairs. They are seen as humanity's greatest deterrence against Demi-human and Magical Creature incursions. It is unfortunate that Magi are typically old and venerable. Sanctioned Mage - A Mage registered under a Tower, beholden to its Laws, Codes of Conduct, and Ethics for Public Practice of Spellcraft. Rogue Mage - A Free-Mage that is not registered, practices magic freely and therefore perceived as dangerous to society. Tier (spell) - Tier 1 to 9 of Spellcraft. Tier 1 - 3 is accessible to almost all Mages. This tier is capable of combating individual, as well as groups of Monsters. Tier 4 - 6 exists within the realm of all Maguses as well as most Senior Mages with a single School of Magic. This tier is capable of wiping out Monster lairs and Demi-human villages. Tier 7 - 9 is open usually to Magisters for reason of both academic-access as well as state sanction. High tiers of Magic can act as strategic-class spells capable of wiping out cities. Tier (Affinity) - The attunement of a Mage to their element. The higher the affinity, the higher the efficacy for Damage and Mana Cost. As Affinity grows, damage increases by a magnitude of 10% for every observable tier. Likewise, mana cost for spells decreases with higher affinity. Though damage increase appears to be on a linear scale, mana cost suffers from diminishing returns. As such, a spell will never be 'free'. Higher affinity likewise involves physiological and psychological changes for the Mage in question. Some examples are provided below, taken from the story-in-progress. Fire Mages are often hot-tempered and over-zealous, possessing a short fuse. Physiologically, they gain resistance to cold and heat. Air Mages become fragile and whispy, becoming airy and flighty in their mannerisms. Earthern Mages undergo the most profound physiological change, becoming taller and more robust, with enhanced musculature, increasing both strength and fortitude. Water Mages are known to be pliable and easily convinced, with personalities that like water, are capable of fitting any vessel. Lightning Mages gain increased metabolism, becoming prideful and possessive beings. Ash Mages are known to become apathetic. Their emotions become dulled by the continued practice of Ash Magic until they waste away. Void Mages are rumoured to exhibit extreme hunger, both physiologically and in terms of their psychological demands. Ooze Mages are said to be slothful and lazy, unmotivated and uninspired. Mineral Mages become dispassionate and pragmatic, often, their eyes take on the likeness of their attuned mineral element. Positive Energy Mages are ubiquitously known to be amiable, friendly and full of life and vigour, possessing a halo of likability. Tier (Creature) - A generic classification system used in common parlance to ratify the danger-level of a particular creature. Goblins usually have a tier of 1. A raid of Goblins may be up to 4 or 5. An adult Dragon up to 11. A Leviathan with a swarm of Mermen may be up to 25 - 30, requiring the mobilisation of a Tower or Towers. Class (Monster) - Military lexicon for the number of Mages needed to pacify a threat. Soldier-Class infer a single Mage. Lieutenant-Class infers the need for a Magus or two or more Mages. General Class requires a Magister. Usually, a party of Mage may subdue a Lieutenant-Class Magical Creature. A Party of Senior Mages lead by a Magus may defeat a General-Class Creature. Some creatures, such as Titans (overlarge Monsters) and Mythics (Land Gods) are likewise a part of this denomination. Class systems differ from nation to nation and are not an official Tower designation. Wildlands - Lands not occupied by Human Cities, separated into Zones. Green - relatively safe for NoM habitation. Orange - unsafe for occupancy, safe for Mages to traverse. Purple - dangerous for both Mages and NoMs, contains hostile creatures that will disrupt human habitation. Black - extremely dangerous for human habitation; zone includes creatures that predate on humans. Environmental factors may also play into codified Zoning. Demi-Humans - Humanoid races that share the Prime Material Plane with Humans. Friendly species include Nordic and Bavarian Dwarves, Keltic Elves, German Gnomes and Hobbits from New Zealand. Hostile races include Goblinoids, Dragonoids, Harpies, Serpentfolk, Merfolk, Mermen (Oceanic), Lizardmen, Dryads, and other sapient beings capable of speech. Like most Magical Creatures, these beings possess a Core. Some Demi-humans are capable of interbreeding with humans. The majority of Human cities are highly xenophobic and racially homogeneous. Magical Creatures - Creatures generated by nature where the veil between the Prime Material and the Elemental Planes are weak. Current theory infers they are Elemental creatures that manifest into the Prime Material. Magical Creatures possess Cores, which are condensed mana that serve as the anchor of the creature's Essence to the Prime Material, giving it life. Cores (Creature) - From the lowest Snotling to the highest Ancient Dragon, all Magical Creatures possess Cores. Upon death, the Core shatters, releasing the wild energies contained within. Interesting fact - ancient creatures have highly condensed and compact Cores that are virtually impervious to damage. Spirit (s) - When a creature possesses a high level of anima, its Core may contain a Spirit. Spirits are potentially found in all forms of Creature Cores, though typically, it is exceedingly rare amongst lower order Magical Creatures. For Spirit-Seekers, the irony lies in that billions of low-tier creatures exist with a lottery's chance of possessing a Spirit. While beings with a high probability of retaining a Core upon death, as well as possessing both ego and anima, are exceedingly rare, and more often than not incredibly powerful. Spirit (Mage) - A Mage dreams of augmenting their elemental powers with a Spirit. A Spirit may be acquired through directly killing and harvesting Cores, then bending the will of the 'anima' of the creature contained therein to the Mage's service. When successfully attuned, the Spirit is absorbed into the Mage's Astral Body, becoming a part of the Mage's ability to channel Elemental powers. The alternate method of gaining a Spirit is through taming existing Magical Creatures and opening one's Astral Body to the foreign Spirit. This methodology is considered highly irregular and potentially fatal for an unsuspecting Mage incapable of melding with the entity. Familiars - Typically, the Conjure Familiar spell is responsible for bonding Elemental entities to a Mage's psyche or anima. Such creatures are manifested from the psyche of the caster. When a Spirit is partnered with the Mage, the Anima of the Spirit usually takes the form of the Familiar. When a Spirit is bonded with a Mage already in possession of a Familiar, it usually subsumes the form of the Familiar and replaces it with its own. It is not known if Familiars can become Spirits through gaining ego and animus. The Frontier - Originally a term denoting cities which are cut off from logistical support after WWII, the term has grown to encompass all Human territories lacking geodynamic Ley-lines. Some Frontier cities such as Merauke, Darwin, Chittagong, and Izmir, are little more than Human havens eking out a living in the wilderness, serving as little more than trading ports and supply stations. Prosperous Frontier cities such as Sydney, Singapore, Naples, Las Vegas, have a quality of life nearing tier 1 cities in all but name, lacking the geography, natural resource and political power to ascend into the status of a tier 1 city. With exceptions akin to continental hub-cities like Singapore and Istanbul, the vast majority of Frontier cities have limited access to Spellcraft and Magitech. Tier 1 Cities - Cities build around powerful convergences of Ley-lines are considered tier 1 cities. These cities have the near-perpetual energy to supply to their internal and external Shielding Stations. To apply for tier 1 status, a city-state must pass muster with the Commonwealth Towers , joining the network of tier 1 cities. Shielding Station - A stationary mini-Tower built to withstand the elements, manned by Abjurers and a patrolling team of Mages. At the heart of the Shielding Station is a Resonance Crystal which projects a frequency harmful to all beings possessing Cores not attuned to a Mage. A Shield Generator Tower creates the resonance, visually manifesting as a shimmering 'wall' or 'barrier', and additional, smaller station refract the "Shielding". ISTC Station - The Inter-State Teleportation Circle Station allow Mages long-range teleportation to and from nations. Prohibitively expensive, ISTC Stations are used only by the upper echelon of Tower Mages and State-level operatives. Most tier 1 cities have ISTC stations to and from the Towers in allied cities, as well as its satellite, Frontier cities. Tower - A robust structure with inbuilt Enchantments. A Tower can vary in size, function and power. In most cities, the Tower functions as a way-station, a bastion, and a nerve-centre for all magical matter. Even the most basic Tower include the ability to amplify the manifestation of Spellcraft of its stationed Mages, the levitation of its structural body, long-distance teleportation and displacement, and the ability to act as a mass-communication Divination array. A tier 1 city's Ley-lines usually provide power to the Tower. For Frontier cities with limited geodynamic supplies of mana, a significant cargo of HDMs are required. The Towers - The United Nation Council of Towers (U.N) refers to a coalition of all Towers from around the world formed after World War II's Beast Tide. Akin to the U.N in Gwen's old world, the Towers sanctify and ratify the regulation of Spellcraft, the status of city-states, and mediate the conflicts of interest between Human nations. Tower (Commonwealth) - Towers belonging to the old British Mageocracy, said to have conquered more than 50% of all Human lands in its Golden Age. The Commonwealth form a loose factional coalition through a shared ideology of social democracy, English as a primary language, and mutual defence-pacts. Tower (Independent) - Towers not beholden to any specific faction and are wholly independent (on paper). Singapore, Istanbul, Tel Aviv, and Hong Kong are examples. Tower (State Owned) - Towers which are a part of the global network of Towers but are beholden to their city-states or nations. Almost all non-independent Towers belong to this category. NoMs - Non-Magical Human Beings, also derivatively known as No-Magic. In the Frontier and tier 1 cities, NoMs serves as a labour force. The majority of NoMs work in agriculture and manufacturing, with a small percentile working in Administration and other white-collar positions. Most NoMs, whether because of indoctrination or the social climate, see the possibility of becoming a Mage, or introducing a Mage to their bloodline to be a way out of a life of oppression, poverty and mediocrity. House (Mage) - A bloodline of Mages usually with a powerful or influential Progenitor. A House usually includes three or more generations of Mages. A Branch House is when a potential heir, usually a sibling, starts a new House with the same bloodline. Clan (Mage) - A coalition of Houses sharing the same bloodline. A Clan involves several hundred individuals across a dozen Branch Houses, supporting the Main House. Clans are highly hierarchical. Clans are also unique, pending context and culture. Asian Clans focus on styles or Schools of Magic, while European Clans may focus on bloodline lineage. Some Clans operate by region, heedless of bloodline or magic. Due to the desire to keep a particular bloodline 'pure' or a specific magical talent prevalent, marriage within the Clan is common. Sect (Mage) - Sects can be religious, ideological, factional, or based upon styles of Magic. In China, old Doushi Clans evolved into Sects, with famous examples such as Kunlun, Huashan, Shaolin, Wutang, The White Lotus Society and so on. The Western world's Sects tend to be based around organised religion, while regions in continental Africa tend to have Sects based around tribal boundaries and shared ancestry. Currency - The objective means by which trade is conducted. Humans use localised currency, LDMs, and HDMs. Mana Crystals (LDMs and HDMs) - Mana Crystal is the currency used by Mages across the human cities. In its raw form, they are harvested from places where the fabric between the Prime Material Plane and the Elemental Planes are thin, allowing 'crystalised' shards of mana to grow. Where there are large volumes of Mana Crystals, there are almost always powerful Magical Beasts. While most mana crystals are non-elementally aligned, rare and precious specimens do exist as gems and precious stones. Examples include Jadeite, Citrine, Emerald, Zircon and Turquoise. Crystal Currency - Defined by the World Bank as a single shard of High or Low-density crystal, containing a standardised (1 LDM or 1 HDM) volume of mana. A shard of LDM resembles a fingerling crystal akin to a 3cm hexagonal pencil. The appearance of LDM currency is exemplified by its semi-opaque state. Comparatively, a shard of HDM is transparent and without blemish, measuring 5 CM. Certification is overseen by a cooperation between the Towers and a local agency (Bank of China, for example). The volume of crystals in circulation is often controlled on the Frontier. LDMs - Low-Density Mana Crystals are commonly used on the Frontier and as lesser denominations. Raw shards of L-D crystal can be exchanged in terms of weight and total mana volume, but cannot be used as formal currency. HDMs - High-Density Mana Crystals are the currency of choice for Mages in the tier 1 cities, consisting of compressed and certified crystals. Currency Cards - Certified cards which contain 10 - 50 - 100 - 1000 HDMs that can be exchanged at local banking branches and Towers. NoM Currency - Local currency issued by the government for use by the NoM population. In poorer Frontiers and tier 1 cities with large volumes of NoM activity, the local currency is vulnerable to hyperinflation, forgery, and currency fraud. Demi-humans and Human Currency - As humans are the only race capable of mass-producing crystal currency, Demi-humans have taken to use human currency as the preferred unit of exchange for barter. Making this for my sake (Big clean up edit + Manuscript in Dec and Jan) and as a response to demand. If you have other Lexicon you guys want in or are confused about - put it in the comments. Bio: I write on the phone and edit at home. Times are tough! Ha, getting this out of the way first, clearing up head canon etc. Always online warrior that man is. for elements, where does the wood element fit in that Henry had? Wood should be the combination of the elemental four(earth, fire, air, water) so should be placed where the earth is in the diagram. Its also possible it falls under the miscellaneous categories due to its rareness. Though exceedingly rare, there exist individuals who are born capable of tapping into all four Prime Elements, becoming mages capable of manipulating 'wood' and other natural phenomena, hypothesised by Eastern Spellcraft as an individual element. It talks about them in the "Prime Material Plane (The Material Realm)" section, right bellow the picture. wood being the (one) positive, what would be the negative... ? I'd imagine it being similar to the Blighter of D&D - draining plants of life similar to Necromancy in order to get the energy to cast spells. Which would also explain why it hasn't come up - bad connotations through the similarity to Necromancy. Do the para-elemental planes have positive and negative transformations as well? Not that I know what they would be.. The only one I can come up with is to switch Ash to Negative Smoke. But it's your world, I'm just curious. XD thanks for the info though, I love it when authors give these out without bogging down the story. It's never not going to bother me that "Magi" and "Magus" are totally different things, and that "Magi" is used as a singular noun. "Magi" is just the pluralization of "Magus," no? We could just say that it is a magical translation error that was kept for tradition. Dats world building fer ya. Thank you for your hard work and for providing such great time for us readers. Oh and start a patreon already, mate, you deserve it. A little bit of sugar, spice and everything nice? Add a little murder, mayhem and malediction? Someone read Daniel Black ? Ayxin as shapeshifting harem master could lead to both double niece sandwich and double uncle sandwich, just saying . . .